It’s a recipe for rich, buttery keto shortbread cookies. It’s the most simple way to create an authentic shortbread cookie that is low in carbs and keto-friendly. If you’re a fan of shortbread cookies, you’re going to love these low carb shortbread cookies. Imagine a keto cookie recipe that allows you to enjoy the classic flavor of shortbread minus the carbs. That’s what this keto cookie recipe offers and in case you don’t know I have a complete list of Keto Cookies that any cookie lover doing keto would enjoy exploring. Shortbread cookies were always a favorite of mine back when I baked with regular flours. The richness that the butter provided in these cookies were pretty addictive. Of course today, I embrace the fat and just push away the bad carbs. So coming up with a keto shortbread cookie option was a must. Can I tell you these keto shortbread cookies did not disappoint? I mean what’s not to love? These cookies have the same texture and taste of traditional shortbread cookies without the worry of being kicked out of ketosis. But not only are these keto shortbread cookies a tasty solution for individuals on a ketogenic diet but even if you’re not doing keto it’s a cookie you can share with the entire family. So when it comes to making authentic keto shortbread cookies, you need to leave the food processor alone and use your fingers instead. We all love to save time in the kitchen, but I promise you these cookies are worth the little extra time it takes to do them by hand. Sure if you use a food processor these keto cookies can be ready to bake much sooner but for a true shortbread that has a nice crumbly texture, you’ll need to use your fingers to form the dough. The reason being is that shortbread cookie dough should not be over handle. By using your fingers you can ensure you do not over process the dough. I opted to add finely chopped pecans to these keto shortbread cookies but you can safely leave them out and not impact the recipe. Another vital tip when making keto shortbread cookies is to make sure that your butter is cold. It doesn’t have to be ice-cold but it should not be at room temperature. The butter should be cold enough that you can slice it and it retains its shape easily. My recipe call for pressing the shortbread dough into a 12X12 pan and then placing the pan in the fridge for at least 45 minutes before baking. That extra step is important in getting the texture right. You can also form the dough into a log and refrigerate the cookie log for about an hour so that you can slice and bake them instead of baking them in a pan. If you opt to slice and bake the cookies will cook a little sooner and they will be done in about 20-25 minutes versus the 35-40 minutes if baked in the pan. These keto shortbread cookies need to be baked in a 300-degree oven. Again this helps the cookie have the “short” bread texture. Cooking them at a lower temperature for a longer period of time helps the cookies be crisp. One of the things that took a complete mind-shift when I went keto was the fact that fat was not the enemy. For years I banished all fats from my diets. Today, I understand the important role the healthy fats offer and how it’s vital to the process of being in ketosis. Which simply means I have no problem enjoying a cookie that features butter as the main star. If I am allowed butter on a low carb keto plan then I am going to take advantage of this and use it in abundance. Because not only does fat enrich the flavor of food but it keeps your hunger hormones stable. Having created a shortbread cookie recipe that was low in carbs meant that I could now have a favorite cookie back in my life. I decided to elevate this recipe by adding some chopped pecans. You can, of course, choose to use any other low carb nuts or leave them out entirely. What’s more, you could also add 1/2 cup sugar-free chocolate chips to these and have another keto shortbread cookie option. If you’re a fan of shortbread cookies, I’ve also created these keto brownie shortbread cookies you would also enjoy. It’s a shortbread brownie combo. I always encourage you to feel free to customize my recipes once you have mastered them. But follow the steps exactly before you attempt to customize for best results. Use this link and get a 15% off discount when you place your order for any of Perfect Keto products. 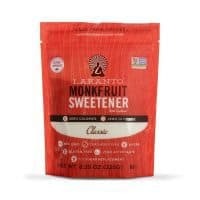 Add the code: FITTOSERVE at checkout for discount. An easy recipe for keto shortbread cookies. It's low in carbs and rich in flavor. Pre-heat oven to 300 degrees. Use an un-greased 12X12 baking pan. Or line two cookie sheets with parchment paper or leave un-greased if you are slicing and baking instead of pressing the dough into a baking pan. Measure then sift the almond flour. Then combine the almond flour, sugar substitute, salt, and baking powder in a medium sized bowl. If you are adding the finely chopped pecans to your recipe, add them now to your dry ingredients. Take out the butter out of the refrigerator and then slice the butter into about 30 slices. Press the dough into a 12x12 un-greased square pan. Place baking pan into the refrigerator to cool for at least 45 minutes. This will ensure that the cookie has the traditional crisp texture of shortbread. Don't skip this step. If you choose to bake your shortbread cookies individually, then form a cookie roll and wrap it in wax paper and allow dough to chill for an hour before attempting to slice and bake. I score the tops of the shortbread with the tines of a fork before baking. Allow the baked shortbread cookies to cool in the panl completely before slicing and serving. You should store leftovers in the fridge. For best results follow the recipe exactly and use your fingers to form the dough. These look great. 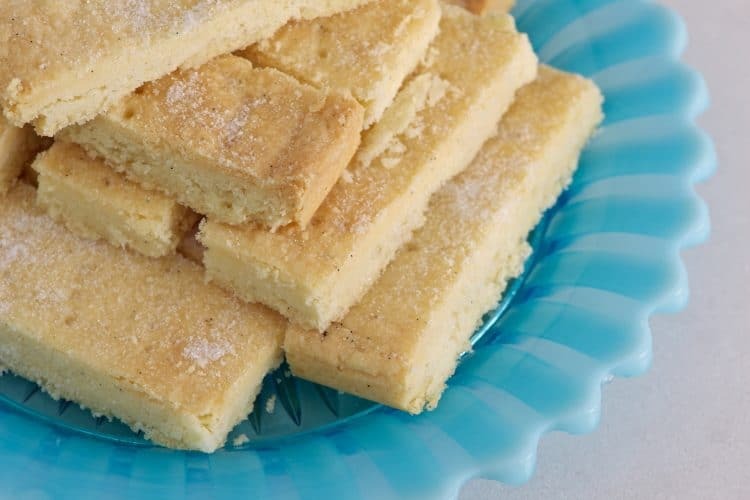 Shortbread is traditional at Scotland's New Year celebrations. I have a hazelnut recipe and this looks even better. Thanks a million! Hi Katie, it's a nice little gem. Enjoy in good health ? Sincerely appreciate you posting what I’m sure will be a delicious recipe, but you might want to look a bit closer at the recipe. I know most start out with “preheat your oven”, but it makes no sense when a step that requires a 45 minute cooling prior to baking comes after preheating the oven. I followed the instructions then turned the oven off after I realized it’d be running with nothing in it for close to an hour when I got to step 6.